Now it comes to the sixth map of Slenderman's Shadow series. The title is 7th Street. 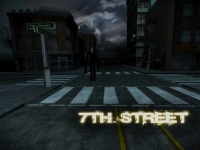 The gameplay takes place in a well-designed square city with two straight main streets which are intersecting each other at the center. It starts when a woman wakes up at the crossroad. From there, the streets look symmetrical. You then have to explore this puzzling city for a mission, to collect eight white pages stuck to some buildings around you. Slenderman ghost never stops hunting with his own way unexpectedly. He could have appeared in front you or next to you as you look to the left or to the right. Walk = W, A, S, D.
Grab a page = Click. Run = Shift + W,A,S,D. Turn on/off the light = F.
Find the exit key on a haunted hedge maze.